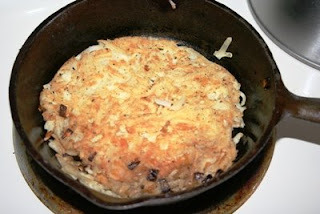 After our experience at Chalet-Swiss, I decided I would go home and make rosti for myself. I felt sure I could match or better what we had there. 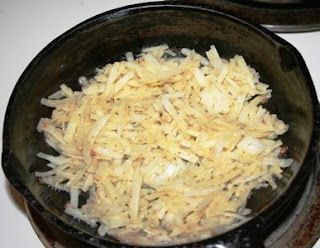 "Rösti is a potato dish from Switzerland. It was originally a common breakfast eaten by farmers in the canton of Bern, but today is eaten all over Switzerland. Many Swiss people consider rösti a national dish. Today it is more commonly served to accompany other dishes, rather than for breakfast." Armed with that knowledge, I woke up this morning and began my quest to make the best rosti I could possibly make with what I had on hand (because I was too lazy and broke to go to the grocery store). My experience was a bit different because I was making 2 individual rosti. 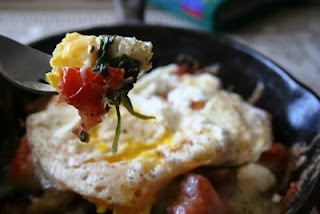 Dev doesn't like spinach or goat cheese or fried eggs (I know- what's wrong with him?) so I made a separate one for him using scrambled eggs and no spinach or goat cheese. To make your life easier, you could do one big one in a 12 inch cast iron skillet and call it a day. 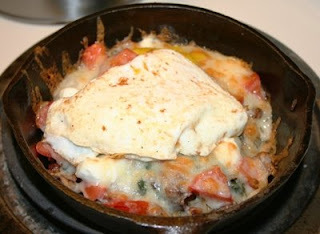 I had 2 little 6 inch cast iron skillets, and really, they are so cute, I had to use them. 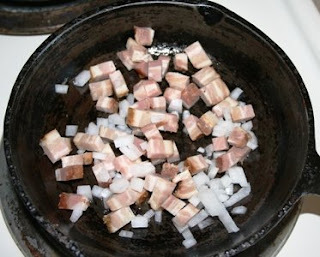 I divided the diced bacon and onion into the two cute cast iron skillets and began rendering the fat. I took the bacon and onion out and set it aside. 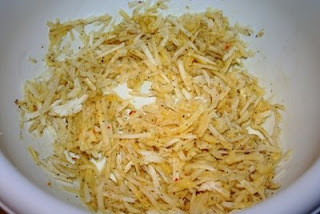 Then I put the hashbrowns in a bowl and added salt, pepper, garlic powder, grill seasoning and 1 beaten egg. I mixed it together pretty well. I divided the pancake mixture evenly between the two skillets and put them over medium heat. I let it sit (without messing with it) for about 5 minutes. Then, I used a spatula and miraculously flipped the pancake in one piece onto the other side. Don't worry if yours doesn't make it in one piece (I'm shocked mine did). 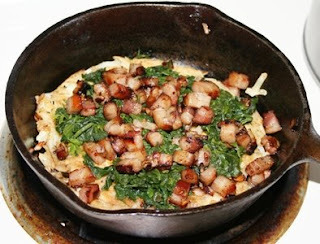 While the underside is cooking, sprinkle the cooked spinach over the pancake, then the bacon and onion. 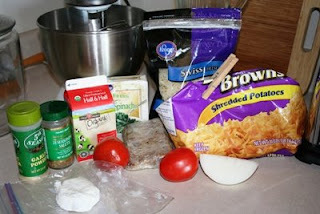 Then add the diced tomato, the goat cheese and the swiss cheese. The one I have pictured is actually Dev's so it also has the scrambled eggs on it as well. Mine was topped with a fried egg after it came out of the oven. 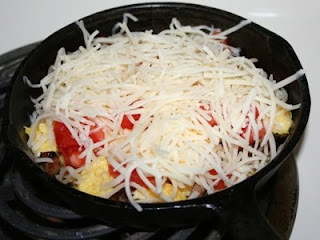 Then I put both skillets under the broiler and cooked them til the cheese was bubbly and beginning to brown. After they were done, I fried an egg and put it on top of mine. I will make this again for sure, but it's strickly a weekend breakfast thing. There are an infinite number of variations, and next time I might try a slightly more Latino flavored version, using green chilies and salsa. I wonder what we'll dream up next weekend.....?